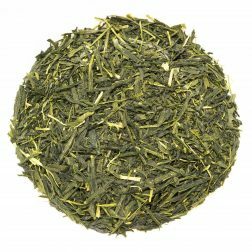 A very fine grade of tea, similar to gyokuro, is steamed and ground to a fine powder by stone mills. 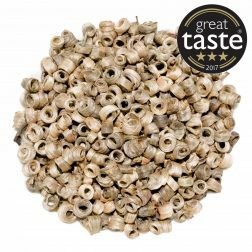 Has a robust flavour that is high in antioxidants and polyphenols. Our Ceremonial Matcha comes from esteemed Japanese tea producer with a 150 year history based in Shizuoka. 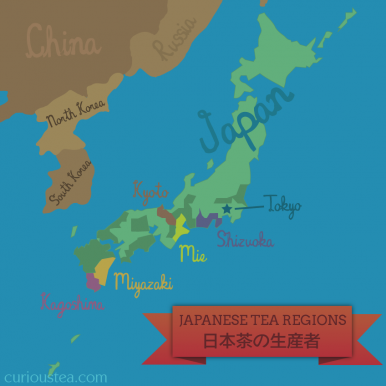 They produce high quality organic and traditional teas on their plantations in Kagoshima, Aichi and Kyoto Prefectures. High quality Ceremonial Matcha is produced from tencha (碾茶), which is the same as gyokuro (玉露), except that after steaming, it is laid flat to dry and crumble. It is then de-veined and de-stemmed, before carefully being ground to a fine powder by stone mills. Matcha powder is delicate and must be stored in its tin, away from strong smells and light to keep flavour and freshness. 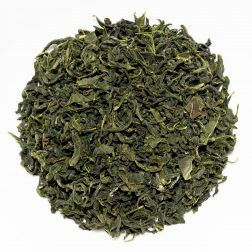 This way it will last a few months, and you will be able to tell from the vibrancy of its green colour how fresh it is. This Ceremonial Matcha has a flavour that is robust, creamy and very ‘green’ tasting. While having a very balanced profile, it leans towards more savoury and umami flavours. As this Ceremonial Matcha is very light, less than a gram (0.7) is needed per 70ml. Matcha is best made with water at 70°C and mixed with a bamboo whisk until smooth. Usually made in a matcha bowl (chawan 茶碗) and measured with a matcha spoon (chashaku 茶杓), warm water is then added and briskly mixed with a matcha whisk (chasen 茶筅) until frothy. Traditionally made with water, modern versions can be made with milk or milk substitutes. You can also use a small hand whisk or put into an air-tight container and shake. Traditionally drunk out of a small matcha bowl, rather than a cup, this tea should be drunk immediately.